This article appeared in the February 2000 issue of Rotunda, the monthly newsletter of the American Museum of Natural History. Reprinted with permission. Somehow, Isaac Asimov found time in between working on his 500-plus books to develop a love for the AMNH's old Hayden Planetarium. 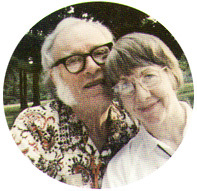 It was a love which his second wife, Dr. Janet Jeppson Asimov, still shares. "Isaac used to participate in symposiums at the planetarium," Janet said during a recent visit to the Museum and the new Frederick Phineas & Sandra Priest Rose Center for Earth and Space. "And, of course, growing up in Westchester, I've loved it since I was a child." Janet, like Isaac, started writing at the age of eleven. "He thought he could never make a living from his writing," she recounted, "so he did other things, as well. He published his first story at the age of 18, then combined teaching with writing for another eight years before he realized he could manage it. I, on the other hand, just went to medical school." Janet finished medical school and became a working psychoanalyst. As soon as her studies were completed, she resumed her writing. "In 1966, I had my first story published in a mystery magazine. At that time, I had been in full-time private practice for ten years, which I continued for another 20 years until Isaac became ill--all without a major vacation." Janet has had 20 books published, some co-authored with Isaac, including the well-loved children's series about Norby, the robot. Though she actually wrote them, "Isaac always read the final draft in case I had made any scientific mistakes." For many years, Isaac had been writing a weekly science column for the L.A. Times Syndicate. When Isaac became ill in 1991, Janet began to write the column for him, hoping he'd get better and return to writing it. "When he grew worse, I called them, telling them he was going to die and that I'd been writing the column, at which point they decided to put both of our names on it. When he did die, I called, telling them I expected the column to end, but they suggested that I continue writing it myself--which I am doing to this day. So I've been a science writer for eight years. It keeps the cerebral cortex in fine fettle." During these years, while working on the column, Janet has often called scientists here at the Museum with a question. "It was difficult for me. I had to research and confirm everything, but it was easy for Isaac. Everything came naturally to him. That's the advantage to being a genius." which returns everything to its proper perspective." The story went on to become the title of one of Isaac's essay collections. The acquisition of the giant squid specimen by the Museum prompted Janet to write a column about this extraordinary creature, and her recent piece on butterflies was partially inspired by the Museum's Butterfly Conservatory. 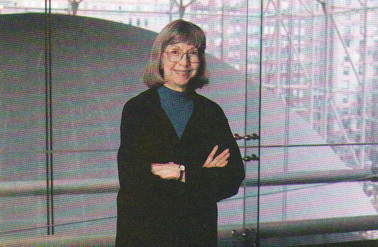 Janet's connection with the Museum is not restricted to New York City. She has traveled on numerous Museum-sponsored trips, including a whale-watching expedition and a trans-Canadian railroad journey. "All the trips were wonderful," she said. "I'm absolutely crazy about this museum," she said in closing. "I wanted to do something in Isaac's memory. Other groups have set-up lectures in his name, but I wanted to do something special." In this spirit, Dr. Janet Jeppson Asimov has established the Isaac Asimov Memorial Fund, which will provide ongoing funding for a yearly lecture or panel series to be held in Isaac's memory in the new Rose Center for Earth and Space. Proceeds from the lecture's ticket sales will support education programming in the Rose Center. This fund is a fitting tribute to one man's love for the Museum and its dedication to the mind-expanding task of exploring the universe--the very boundaries of which we visit, in imagination, as we read his writings.